The former is a big deal for bringing more developers into the fold. The latter is a big deal for any developers who want to see webOS succeed. Read on for our thoughts on what opportunities for cool apps and features can be found in the new APIs coming with webOS 2.0. We won't know for awhile whether it's fair to say that webOS 2.0 leads the smartphone pack in terms of compatibility with the latest HTML5 technologies we're seeing on desktop browsers like Chrome, Firefox, and Safari. We do know that Palm is packing in as much as they can in the time between now and release: hardware-accelerated CSS transitions, Applicaiton Cache, Offline Mode, Geolocation. The magic happens with Mojo Core, which is a set of APIs designed to allow standard web-app code to talk to Palm's own webOS/Mojo code. Instead of recoding portions of web code to work on webOS, developers can keep their curent engines and just add a few small calls to Mojo Core APIs to turn their apps into fully-native webOS apps. Add in the earlier-mentioned HTML5 features coming in webOS 2.0 and functionality like geolocation and local storage shouldn't need to be rewritten either. Basically: any site with a decent HTML5 web app designed for mobile webkit browsers should require very little work to turn their page into a native webOS App and supporting that app shouldn't be a large additional burden as the mobile site is updated. We're looking at you, Google, justsaying. While we're excited by the possibility of seeing more web apps and PDK apps ported over to webOS, what's really exciting for the platform is the possibility of seeing apps that take advantage of functionality that simply can't be reproduced on other platforms. Unique features can drive adoption and adoption drives more development and all of the sudden we're looking at a virtuous cycle of developers and users flocking to the platform. That's the idea, anyway. So what does webOS 2.0 bring to potentially jumpstart this cycle? Synergy is now open: Palm is letting any developer create Synergy services for Contacts, Calendar, and Messaging (though not, as of yet, access to data brought in by other Synergy streams). Developers looking to make webOS the premier phone for, say, SalesForce or Lotus Notes or any other custom contact service could find a big opportunity here. Developers looking to hook up users with calendar/service sites like Upcoming or Eventful should also sit up and take note. Most of all: developers looking to integrate more instant communication like Twitter or PingChat should take a long, hard look at how they can integrate into both Contacts and Messaging now. Exhibition could bigger than you think: We're not sure whether we'll be wowed or underwhelmed by Palm's Touchstone-mode, but the more we think about it the more we're warming up to what developers might come up with. In Exhibition mode, you know that the device is powered, so pinging Twitter and Facebook and what-have-you as often as you like shouldn't pose a significant problem. An exhibition that pulls from a configurable set of services and displays their info in a real-time stream, well, that sounds pretty keen to us. I want to do Action X. I need to open App Y for that. Where is App Y? Ah, there is App Y. Ok, App Y open. How do I initiate Action X in App Y? Ah yes, here is the button for Action X. Action X begun. ...And done. I want to do Action X. Action X begun. Let's execute it with App Y. ...And done. This is a 'Command Line Interface' (CLI) philosophy and until you've used it on a desktop with something like Quicksilver or Google Quick Search, it's hard to describe how powerful it can be. When your app supports Quick Actions, it's essentially the same as making it a service available across the entire device. Your app will be as natural and immediate as the Just Type feature itself. 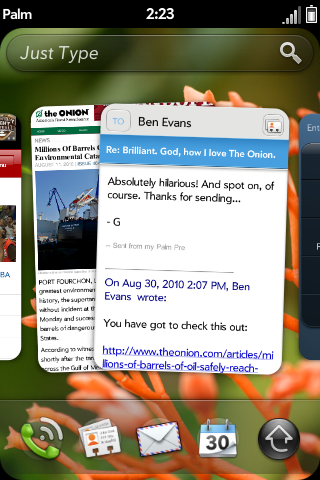 Your users won't be able to imagine using webOS without it. Hybrid PDK Apps combine speed and power: You'll be able to code up parts of your app in the standard webOS app with the standard webOS speed and ease of development without having to give up native code and you'll be able to have the power of native code (compiled pretty much however you'd like - Palm's not too picky here) without giving up the speed and simplicity of standard webOS code. We're still expecting more robust support for some of the standard stuff: Microphone, Camera, Media Indexer, etc. Those sorts of APIs should come and soon. From a developer-perspective, Palm still needs to fill a lot of API gaps and hopefully they'll be bringing plenty of development-spackle to shore up the holes between the bricks we listed above. What we're really curious to know is this: what development possibilities do you see in webOS 2.0? Users, Developers: tell us!